On Thursday, US President Donald Trump promised that India will soon see his decision on punitive measures after New Delhi moved to purchase advanced S-400 air defense systems from Russia. The US government is "very carefully" reviewing India's decision to continue buying oil from Iran and purchase Russian S-400 missile systems, according to US State Department spokeswoman Heather Nauert. "Certainly when we hear about things such as purchasing [Iranian] oil or the S-400 systems, it's not helpful," she added. Nauert noted that she had earlier seen reports of India continuing to buy oil from Iran, a topic which she said was discussed during US Secretary of State Mike Pompeo's visit to India last month. "The President had addressed it — I believe it was just earlier today — which he was asked about, that question about whether or not India would buy oil from Iran after sanctions are reimposed. And the President said — and I'm not going to get ahead of the President, certainly — but he said we'll take care of that," she said. Nauert's remarks came after US President Donald Trump pledged that India "will soon find out" his decision on launching punitive measures under the Countering America's Adversaries Through Sanctions Act (CAATSA) after New Delhi decided to spend more than $5 billion on S-400 air defense missiles from Russia. When asked exactly when India would find this out, Trump said: "You will see. Sooner than you think." Although countries which do business with US "adversaries" are subject to sanctions under CAATSA, Trump has the right to grant a waiver to India; therefore, Washington could opt to effectively overlook the weapons deal with Russia. Kremlin spokesman Dmitry Peskov told Sputnik last week that Russia and India had inked a historic $5.4 billion deal on the supply of the S-400 Triumf air defense missiles to New Delhi. The agreement was clinched during President Vladimir Putin's visit to India for talks with the country's Prime Minister Narendra Modi. In a separate development, Indian Oil Minister Dharmendra Pradhan said that New Delhi would continue importing crude oil from Iran next month. "Overall with regard to those sanctions that will take effect on November 4th — and you're referring to the oil sanctions for Iran and countries that choose to continue purchasing oil from Iran — we have had conversations with many partners and allies around the world about those sanctions," Pradhan pointed out. 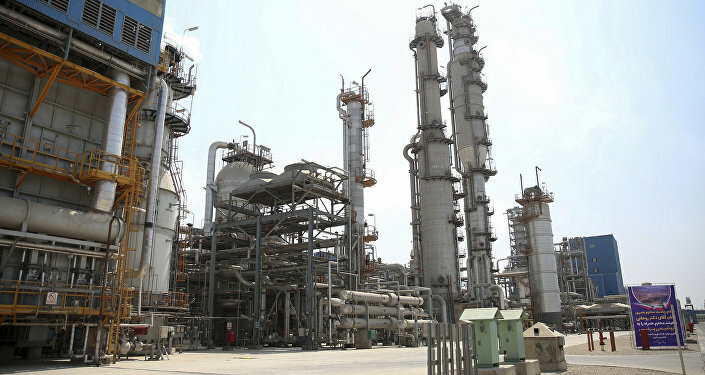 Earlier, Indian oil refiners reportedly placed a contract for 1.25 million metric tons of Iranian crude to be imported in the month of November. In September, India and Iran inked a key agreement that would allow them to skirt US sanctions on Iran's energy sector, which will come into effect on November 4. Under the deal, the Indian government will would make payments for oil shipments from Iran in rupees, while the Islamic Republic could use these rupees to pay for imports from India. On May 8, Trump announced the US's withdrawal from the 2015 Iran nuclear deal, also known as the Joint Comprehensive Plan of Action (JCPOA), vowing to impose the "highest level" of sanctions on Tehran. He also urged countries to stop buying Iranian oil from November 4 and threatened to use sanctions against those which refuse to do so.